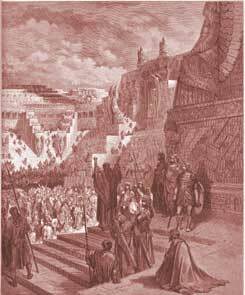 Ezra goes up to Jerusalem. (1-10) The commission to Ezra. (11-26) Ezra blesses God for his favour. (27,28)1-10 Ezra went from Babylon to Jerusalem, for the good of his country. The king was kind to him; he granted all his requests, whatever Ezra desired to enable him to serve his country. When he went, many went with him; he obtained favour from his king, by the Divine favour. Every creature is that to us, which God makes it to be. We must see the hand of God in the events that befal us, and acknowledge him with thankfulness. 11-26 The liberality of heathen kings to support the worship of God, reproached the conduct of many kings of Judah, and will rise up in judgment against the covetousness of wealthy professed Christians, who will not promote the cause of God. But the weapons of Christian ministers are not carnal. Faithful preaching, holy lives, fervent prayers, and patient suffering when called to it, are the means to bring men into obedience to Christ. 27,28 Two things Ezra blessed God for: 1. For his commission. If any good appear in our hearts, or in the hearts of others, we must own that God put it there, and bless him; it is he that worketh in us, both to will and to do that which is good. 2. For his encouragement: God has extended mercy to me. Ezra was a man of courage, yet he ascribed this not to his own heart, but to God's hand. If God give us his hand, we are bold and cheerful; if he withdraw it, we are weak as water. Whatever we are enabled to do for God and those around us, God must have all the glory. Ezra was an obedient servant of God, with the others who went along. It is amazing how God will any use who is willing. No matter how simple or great a task. Jesus use me, and oh Lord,don’t refuse me, surely there’s a work that I can do, and even though it’s humble, Lord help my will to crumble, though the task be great, I’ll work for you. We have to be willing, and waiting for God to use us. Verse 6~Ezra received a favorable hearing from the king because he was faithful and he prayed to Jehovah God to be heard. It should also be our desire to be devoted to God as Ezra was. I am more than a conqueror in Jesus name! Ezra was obedient to GOD's commission, because of his obedience GOD blessed him with courage and encouragement to move move forward. GOD also blessed him with the King's providence,provision. GOD has promised to be with us and protect us always, in HIS own way< according to HIS divine will and purpose. Amen!!! What Do You Think of Ezra 7? What did Ezra prepare his heart to do?